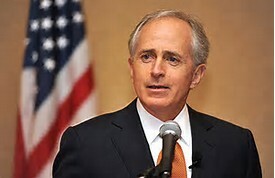 A Disgruntled Republican in Nashville: Bob Corker, guest of 1st Tuesday, April 24th. Its EXTREMELY rare to hear from and ask questions in a private setting of today's most critically important US Senators. That is exactly the opportunity before us Monday, April 24th when Tennessee Senator BOB CORKER returns to 1ST TUESDAY. This is going to be Q&A Session unlike any other !!! Senator Corker plans for brief comments and the rest of our hour for Q&A. Come prepared to ask questions ! This is simply a MUST SEE event. We must start 30 minutes early to meet his flight schedule. Doors at Waller Law [511 Union Street -27th floor] open at 10:30. Lunch is $20 for Members and $25 for Guests and begins at 11:00. Senator Corker will begin shortly after 11:30. Q& A will end at 12:30 sharp with him departing. Secure seating at www.1sttuesdaynashville.com and click on “JOIN US’’. Or make your check to 1ST TUESDAY and mail to my attention by April 17th. Email me... or call ... if you do so. You will get a confirming return email from me !!! Send to: Tim Skow Box 1233 Brentwood, TN 37024. See you MONDAY, April 24th !